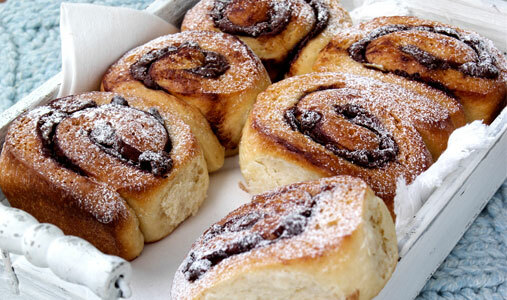 These pretty chocolate chip chelsea buns don’t cost a pretty penny, at just 73p each. Spend 50 mins preparing them as a treat for your friends. 1. Mix all the yeast mixture ingredients together and leave in a warm place for 20 mins or until frothy. 2. Rub the butter into the flour until it resembles fine crumbs. Add the egg to the yeast mixture, mix well then add to the crumbs. Knead the dough for about 10 mins until smooth. Cover with cling film and leave to rise until doubled in size. 3. Roll the dough out on to a floured surface to form a 1cm thick rectangle. Sprinkle over the chocolate chips, sugar and cinnamon and roll into a sausage. 4. Cut into 3cm slices and arrange them on a 15x20cm baking tray. Bake for 20 mins. Drizzle a little golden syrup over the buns as a glaze. Serve hot or cold. Enjoy guilt free after a fennel, pea and broad bean salad!